With his children, Tom Reynolds established the Patricia R. Reynolds Endowment for Sarcoma Research in her memory and remained steadfast in support for this rarer form of cancer. Tom Reynolds, who passed away in October 2016, was a beloved member of the Winship family and is remembered as a man of character. His outstanding traits included his faith, his love of family, and his strength of spirit. He was a devoted advocate for Winship in the community and made a tangible difference in his volunteerism and philanthropy for the cause of cancer research. 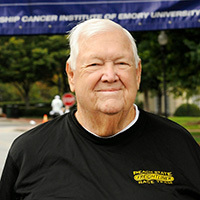 A long-time cancer survivor himself, Reynolds lost his beloved wife, Patricia, to sarcoma in 2005. With his children, he established the Patricia R. Reynolds Endowment for Sarcoma Research in her memory and remained steadfast in support for this rarer form of cancer. The Reynolds's children -- Ann Crouse, Rick Reynolds, and the late Tim Reynolds – followed their father's lead and have been active supporters of both sarcoma research and breast cancer research. Six years ago, when the Winship Win the Fight 5K was just an idea, Reynolds enthusiastically signed on his company, Peach State Truck Centers, as one of the original and largest corporate sponsors. Reynolds also made Peach State an original patron of the Winship Gala. He had a genuine interest in serving others and his joy of life was contagious. 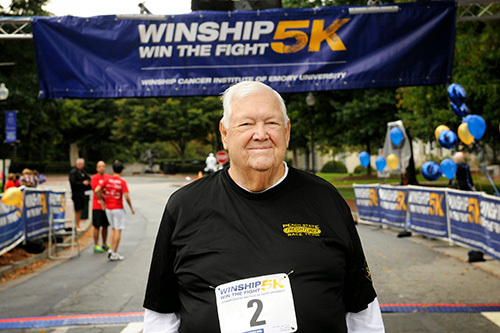 Tom Reynolds at the 2014 Winship Win the Fight 5K.